The visiting teaching gift for December is sure to be a favorite! 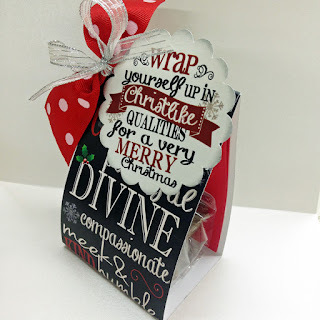 All year long, the messages from the Ensign have focused on "The Divine Attributes of Jesus Christ," so we have taken all of those attributes from the whole year and made a beautiful print, which we've used to "wrap" up the treat and message. The black chalkboard print includes words like; divine, kind, compassionate, full of glory, merciful, obedient, patient, virtuous, forgiving, etc - and wraps around 1/4 pound of chocolate covered cinnamon bears. A darling tag ties it all together that reads, "Wrap yourself up in Christlike qualities for a Very Merry Christmas"
The message from the Ensign this December is written by the Prophet, President Thomas S. Monson. It is entitled, "Make Time for the Savior." What a great topic for this time of year! The title of the official December's Visiting Teaching message from the Ensign is "The Divine Mission of Jesus Christ: Prince of Peace." We have included the full message from the Ensign, a 3"x4" print of Mary holding baby Jesus (painting by Simon Dewey), and a Dove milk chocolate bar. 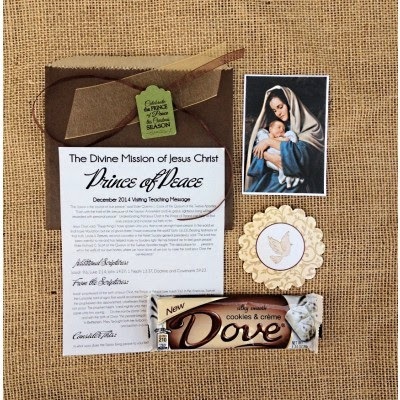 Wrapped in a chocolate brown gift sack, a tag with a graphic of a dove on it, and a tag that reads, "Celebrate the Prince of Peace this Christmas Season" - this gift will be just right for the sisters you visit teach.